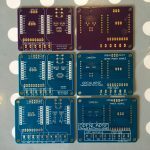 So I ordered three sets of PCBs from OSH Park (USA) and Seeed Studios (China). They were ordered very close to each other. Here’s a breakdown on how quick they got here, and how much they cost. Interestingly, they all shipped the same day (June 5th). Each company does different amounts of boards per order. OSH Park give you 3, whereas Seeed give you 10. OSH Park do free shipping, Seeed charge about $15 for an order, but the PCB cost is cheaper, so works out about the same for regular shipping ($22 vs $20). DHL hit me with an ‘admin’ charge of more than the entire cost of the order, even though the shipping was super quick. 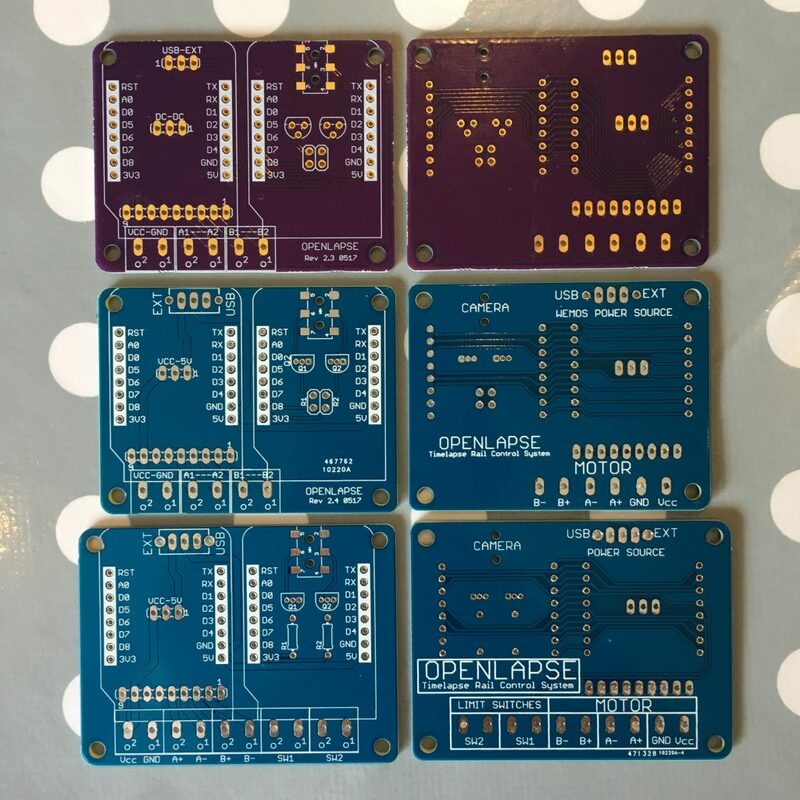 With 10 boards, it still worked out at under $6 per board, so was OK, as I got them in 8 days from order. Normally I’d be OK waiting the 20 days. At least now I know about the admin charge with DHL. So here’s a look at the three boards. OSH Park is the top two, and the bottom four are Seeed. All three are different revisions, so there’s less on the OSH Park (it was ordered first, then modified). Click on the image for a close look. Be sure to check out the project posts that led to the design of this this board. Early designs used a Raspberry, but more recently I use a WeMos D1 Mini ESP8266 board with the above PCB as a controller. Whats the size of the boards and number of layers ? Matt, they were 65mm x 50mm.